2. Combine all the vegetables in to a big mixing bowl and drizzle with 3 tablespoons oil; and a pinch of salt and pepper. Toss until they are evenly coated, and then transfer to the baking sheet. 3. Roast the vegetables for 35 minutes or until they are tender and light golden brown, stirring occasionally to ensure even cooking. 4. While the vegetables roast, combine the mustard, vinegar, herbs honey, salt and pepper into a small bowl and whisk together before slowly adding the oil and whisking again. 5. 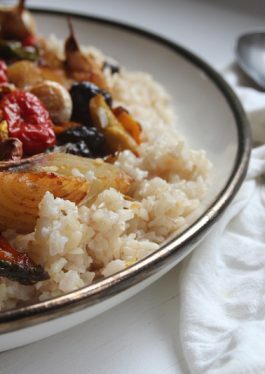 Once the vegetables are roasted, remove from the oven and allow them to rest while you prepare the rice by adding 2 packets of Veetee Brown Rice and a splash of chicken stock to a sauce-pan. Gently simmer for 2 minutes to heat through stirring occasionally. 6. 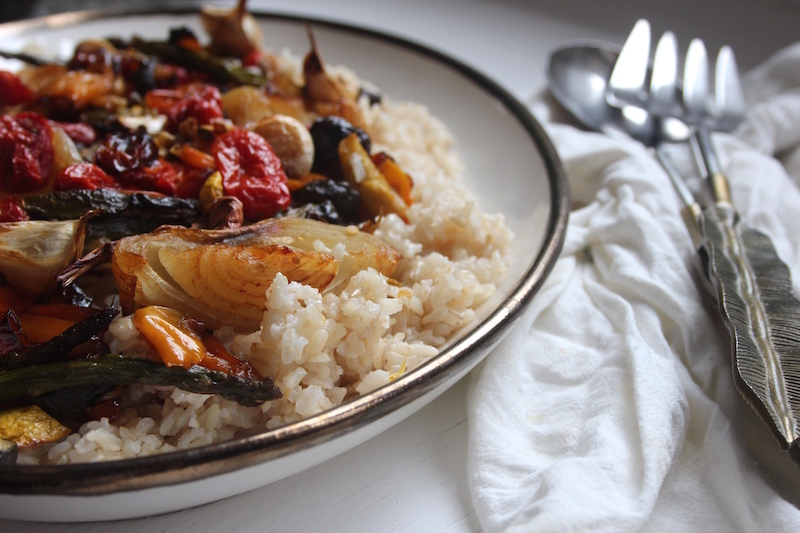 Transfer the rice to a serving tray, top with the roasted vegetables and garnish with the dressing before serving.